1963-1973: Grow up in Wheaton, IL—a pleasant suburb of Chicago. 1973-1983: Grow up further in Costa Mesa, California— another pleasant suburb. As Boho Productions, my friends and I make movies while we're not playing games. 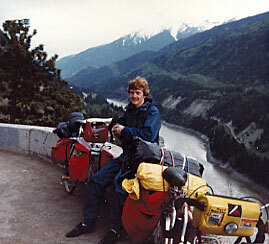 1983: Took a big bicycle trip from Seattle to Chicago, through the Canadian Rockies. The journey takes 5 weeks, averaging 70 miles per day. 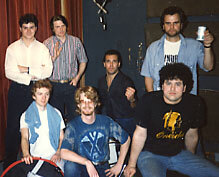 1984-1989: I move to Chicago to work at brother Mike's recording studio, Acme, as the office manager. While in Chicago, I play a lot of silly improvised music in the studio and play in three bands: Millard Fillmore Sextet, Crash Dummies, and Tribe. This is where I start to enjoy taking care of printing and graphic design. I help Mike grow our real-time cassette duplication business, which becomes our main source of income. We also become the first CD mastering facility in Chicago, and the only place to get small quantities of short-length cassettes. 1989-1992: After the untimely death of brother Mike, I take over running Acme. Soon, we find out that we must move the business to another location. With the help of Blaise Barton, Paul Smith, Kevin Aldrich and many others, we purchase a building, remodel it into a modern large studio and move in, over the course of a long year. In the next three years, we go 24-track, record a Bob Dylan album, and appear on the cover of Mix Magazine. 1993: As the cassette business peaks and begins to be eclipsed by the CD, I decide to sell the business, and continue to manage it for six months before resigning. 1994: With ex-Acme employee, now girlfriend, Stacey, we move to Placerville, California (between Sacramento and Lake Tahoe) where we live for 5 months before realizing it's not the place for us. We miss the city, and decide to move to Los Angeles. 1995-Present: We move to West L.A. where Stacey and I get married and buy a house. I become art director at Rainbo Records, a CD and Vinyl Record manufacturing plant. In my spare time, I record children's stories, make music, and do freelance web design. 1999-2005: I take improvising classes from Jane Morris and Jeff Michalski and perform live weekly in the improv group "The Unusual Suspects" every Friday in Santa Monica, CA. 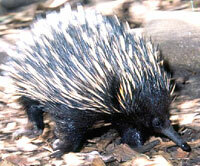 The pygmy echidna is never offered as an audience suggestion. 2007: With Bill Jenkins, I write and star in the silly play "Bob and Ed's Discount Enlightenment Warehouse," which gets a great review in the L.A. Weekly and runs for several months.